When a child or adolescent complains of pain and tenderness near the bottom of the kneecap, the problem might be from jumper's knee. Kids in sports that require a lot of kicking, jumping, or running are affected most. Doing these actions over and over can lead to pain in the tendon that stretches over the front of the kneecap. Sometimes the bone growth center at the bottom tip of the kneecap is affected. This condition is known as Sinding-Larsen-Johansson disorder. It is mostly likely to occur during growth spurts. Disruption within the developing bone in the bottom tip of the kneecap may produce pain and tenderness in the front of the knee. Fortunately, this condition is not serious. It is usually only temporary and will improve with age. What part of the knee is involved? Jumper's knee affects the patellar tendon. The patellar tendon connects the large and powerful quadriceps muscle in the front of the thigh to the tibia (shinbone). The patellar tendon wraps over the front of the patella (kneecap). The upper end of the patellar tendon connects to the bottom tip of the patella. This area is called the inferior pole of the patella. The lower end of the patellar tendon connects to a small bump of bone on the front surface of the tibia. This bump is called the tibial tuberosity. Jumper's knee is usually caused by overuse of the patellar tendon. Kids who play sports with lots of squatting and jumping seem to be most at risk. In order to squat and to land softly from a jump, the quadriceps muscle must work extra hard to slow the body down and protect the knee. It does this by lengthening as it works, which is called an eccentric contraction. This muscle action places unusually high tension on the patellar tendon. When squatting and jumping are done over and over, the repetitive stress on the tendon causes injury to the individual fibers of the tendon. The tendon becomes inflamed and painful. This is the condition called jumper's knee. Another possible cause of jumper's knee is from abnormal alignment of the lower limbs. Kids who are knock-kneed or flat-footed seem to be most prone to the condition. These altered postures put a sharper angle between the quadriceps muscle and the patellar tendon. This angle is called the Q-angle. 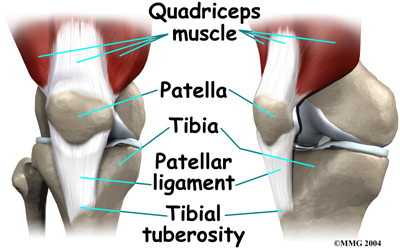 A large Q-angle means there is already more tension on the patellar tendon. The risk of developing jumper's knee is thus higher. A large Q-angle also places abnormal tension on the bone growth plate of the inferior pole of the patella, increasing the risk for Sinding-Larsen-Johansson disorder. A high-riding patella, called patella alta, is also thought to contribute to development of jumper's knee in children and adolescents. Patellar tendon pain has a slightly different cause in an active child whose bones are not done growing. Increased tension in the tendon starts during growth spurts. The patellar tendon is unable to keep up with the growth of the lower leg. As a result, the tendon is too short. This causes the tendon to pull on the bottom tip of the kneecap. Heavy or repetitive sports activity stresses this area even more. Eventually the increased tension disrupts normal growth of the bottom tip of the patella. When this happens, the condition is known as Sinding-Larsen-Johansson disorder. This unique condition is part of a category of bone development disorders known as the osteochondroses. (Osteo means bone, and chondro means cartilage.) In normal development, specialized bone growth centers (called growth plates) change over time from cartilage to bone. The growth plates expand and unite. This is how bones grow in length and width. Bone growth centers are located throughout the body. Children with bone development disorders in one part of their body are likely to develop similar problems elsewhere. For example, children who have Sinding-Larsen-Johansson disorder also have a small chance of bone growth problems where the lower end of the patellar tendon attaches to the tibial tuberosity. This is known as an Osgood Schlatter lesion. Jumper's knee commonly produces pain and tenderness directly over the patellar tendon, just below the kneecap. Sometimes there is a small amount of swelling. Kneeling on the sore knee usually hurts. Activities where the quadriceps muscle works eccentrically, such as squatting, jumping, and going down stairs, are often painful. Kids with Sinding-Larsen-Johansson disorder may feel similar symptoms along the top of the kneecap, where the quadriceps muscle meets the patellar tendon. Sometimes they feel tightness in this area, especially when they try to fully bend the knee. The history and physical examination are usually enough to make the diagnosis of jumper's knee. The doctor will need information about the child's age and activity level. The doctor will press on and around the patella and patellar tendon to see if there is any tenderness. The doctor will compare the sore knee and the healthy knee. The doctor may also ask the patient to straighten the knee against resistance. This makes the quadriceps muscle work, putting tension on the patellar tendon. Pain during this test can help the doctor make the diagnosis of jumper's knee. If the doctor suspects problems with Sinding-Larsen-Johansson disorder, it is likely that an X-ray will be ordered. The X-ray is taken from the side of the knee. This view may show small fragments of bone where tension in the patellar tendon has disrupted the growth plate in the bottom tip of the patella. The X-ray may also show calcification or roughness around the bottom of the patella. An X-ray will be needed if the kneecap is painful from trauma such as a fall. In this case, the X-ray will help the doctor see if a patellar fracture has occurred. Occasionally, a magnetic resonance imaging (MRI) scan may show more detail. The MRI can give a better view of any calcification in the patellar tendon where it attaches on the bottom tip of the kneecap. The MRI can detect swelling. It can also show if injury or inflammation is present within the patellar tendon. 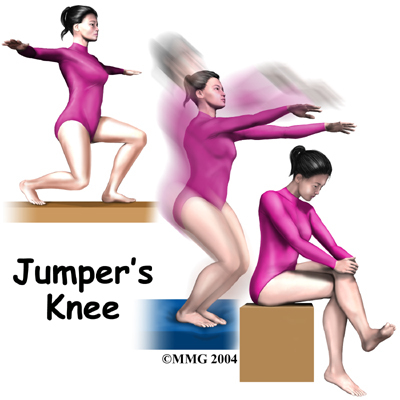 In some cases of jumper's knee, the patient may need to stop sports activities for a short period. This gets the pain and inflammation under control. Usually patients don't need to avoid sports for a long time. When jumper's knee is affecting a patient before the skeleton has stopped growing (Sinding-Larsen-Johansson disorder), the passing of time may be all that is needed. 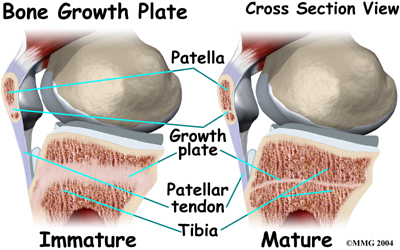 It takes one to two years for the bone growth plates that make up the inferior pole of the patella to grow together and form one solid bone. At this point, pain and symptoms usually go away completely. To treat jumper's knee, the doctor may prescribe anti-inflammatory medicine to help reduce swelling. A variety of knee straps and sleeves are available that may help keep pain to a minimum. The doctor may also suggest working with a physical therapist. Physical therapy treatments might use ice, heat, or ultrasound to control inflammation and pain. As symptoms ease, the physical therapist works on flexibility, strength, and muscle balance in the knee. Posture exercises can help improve knee alignment. The therapist may also design special shoe inserts, called orthotics, to support flat feet or to correct knock-kneed posture. Cortisone injections are commonly used to control pain and inflammation in other types of injuries. However, a cortisone injection is usually not appropriate for this condition. Cortisone injections haven't shown consistently good results for jumper's knee. There is also a high risk that the cortisone will cause the patellar tendon to rupture. Surgery is rarely needed for jumper's knee. Surgery is really not even an option when symptoms are caused by Sinding-Larsen-Johansson disorder, unless bone growth is complete and symptoms have not gone away with nonsurgical treatment. Even then, surgery for Sinding-Larsen-Johansson disorder is unusual. Surgery may be considered if the problem involves only the tendon (not the growth plate) and if symptoms have not gone away with other forms of treatment. 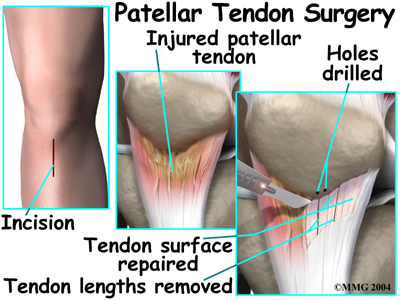 In these cases, the surgeon may do an operation to strip away inflamed and damaged tissue on the surface of the patellar tendon. In this procedure, a small incision is made down the front of the knee, below the patella. The skin is opened to expose the patellar tendon. Next, the surgeon carefully peels damaged tissue off the surface of the tendon. Three to five thin lengths of the tendon are removed. In some cases, small drill holes are made in the bottom tip of the patella. The drilling causes a small amount of bleeding, which signals the body to begin healing the area. Then the surgeon removes any damaged tissue nearby. To complete the operation, the surgeon stitches up the skin and wraps the area with a bandage. What can be expected from treatment? In nonsurgical rehabilitation, the goal is to reduce pain and inflammation. Nonsurgical treatment can help ease symptoms of jumper's knee. Some doctors have their patients work with a physical therapist. Treatments such as heat, ice, and ultrasound may be used to ease pain and swelling. Therapists also work on the possible causes of the problem. For example, flexibility exercises for the hamstring and quadriceps muscles can help reduce tension in the patellar tendon where it attaches to the patella. Orthotics are sometimes issued to put the leg and knee in good alignment. Strengthening exercises to improve muscle balance can help the kneecap to move correctly during activity. Therapists work with athletes to help them improve their form and reduce knee strain during their sports. When symptoms are especially bad, patients may need to avoid activities that make their pain worse, including sports. When the problem involves the bone growth plate (Sinding-Larsen-Johannson disorder), the symptoms tend to go away slowly over time. This means nonsurgical rehabilitation probably won't cure the problem. Treatments can only give short-term relief. The surgeon may recommend wearing a hinged knee brace for a few weeks after surgery. The brace lets the knee bend, but it doesn't let the quadriceps muscle fully straighten the knee. Crutches may be needed for a few days after the operation, until the patient can bear weight without pain or problems. Patients need to check in with the surgeon 10 to 14 days after surgery. Stitches are taken out, and patients are encouraged to begin actively bending and straightening the knee. The surgeon may recommend physical therapy after the operation. The first few physical therapy treatments are designed to help control the pain and swelling from the surgery. The physical therapist will choose exercises to help improve knee motion and to get the quadriceps muscles toned again. Daily activities can be resumed gradually. Vigorous activities and exercise should be avoided for at least six weeks after surgery. Athletes should hold off high-level sports for six months. After that they should be safe to go back to their sports, as long as they have regained normal strength in the quadriceps muscle.